In this original comedy, hilarity and heartbreak ensue when four dictators fight to conquer new land. 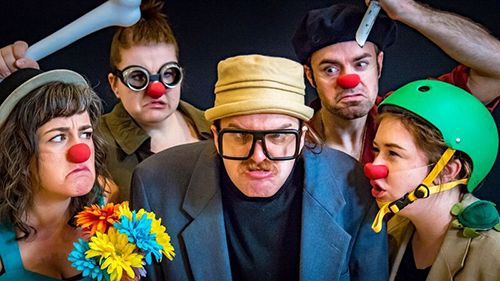 Using mime, clowning and vaudevillian humor, A Muse Zoo takes you on a wild ride! The five members of A Muse Zoo met in a physical theatre master class in the mountains of Ashland, OR where they honed their craft. In AMZ’s first meeting, they decided that no one wants to see a clown show. In that same meeting, they all agreed to put on a clown show. The idea for The Truth* sparked. A Muse Zoo decided to get down to brass tacks and dedicated an entire summer to rehearsals, five days a week. What did they do during those long, grueling rehearsals, you ask? They wrote and wrote and rewrote, scrapped half their show and wrote it again. They found costumes, researched, made clown noses, sewed, hot glued, power tooled and built props. They previewed the show for friends, and finally, built a set that’s mobile and easy to set up and take down. They directed, acted, designed, built, sweat, bled and sacrificed their social lives (and a newborn goat) in order to produce this show. Two of A Muse Zoo’s five members, Sarah Brizek and Mikey Hays, spent a season at Ashland’s renowned repertory theatre, the Oregon Shakespeare Festival. Mike Dias spent 11 years in Los Angeles as a professional actor and was a founding member of the award winning sketch comedy group Monster Party. THE TRUTH* is a skillfully eccentric physical comedy play that explores the absurdities of political power. Laughter, tears, and insanity ensue as we learn that the truth is not always relevant, but the experiences of the people always are.